The Glasgow Dental Hospital, situated 10 minutes from Govan Dentists, is a base for out-of-hours emergency dental services for all dental practices in the region including Govan Dental Care. In order to access this service a phone number for NHS 24 can be obtained from the out-of-hours-answerphone on 0141 445 1829. The Dental Hospital will not see you during normal working hours, but that is OK as at Govan Dental Care we have reserved appointments for folks calling in an emergency. Feel free to contact us on 0141 445 1829 or even better BOOK ONLINE. In addition to the above, the remainder and majority of the Glasgow Dental Hospital offers secondary-care for a variety of dental sub-specialties. For example, in the event that your treatment at Govan Dental Care has not been successful, you can and will often be referred to a consultant at the Dental Hospital for a second opinion or further treatment. 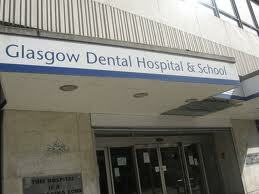 Lastly, the Glasgow Dental Hospital also contains the Dental School where dentists are trained. Most, if not all, of our dentists – including Mr Stewart Paul, Mr John Dardis and Mr Owen Walls have graduated from this prestigious location. For any questions regarding the dental hospital, or if you would like a referral there, please arrange a FREE consultation with us at Govan Dental Care first by calling 0141 445 1829 or by BOOKING ONLINE. To get in touch with us, call us on 0141 445 1829 or click here to go to our contact page.